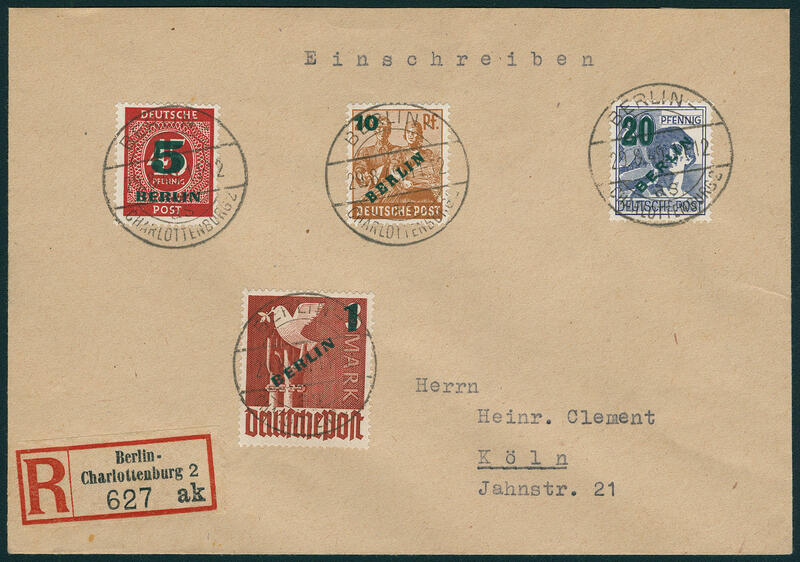 6488 ✉ 64/67 Green overprint 1949, wonderful set franking on very nice registered cover from \"BERLIN-CHARLOTTENBURG 13.10.49. 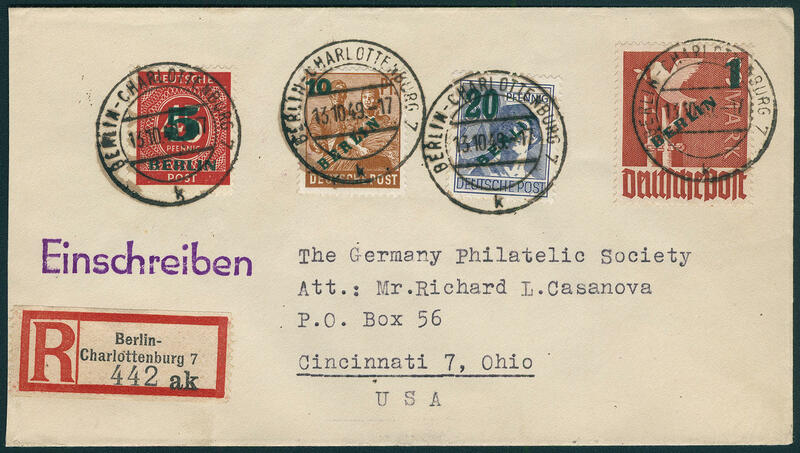 \" to cincinnati / USA with arrival postmarks. Rare in this form! 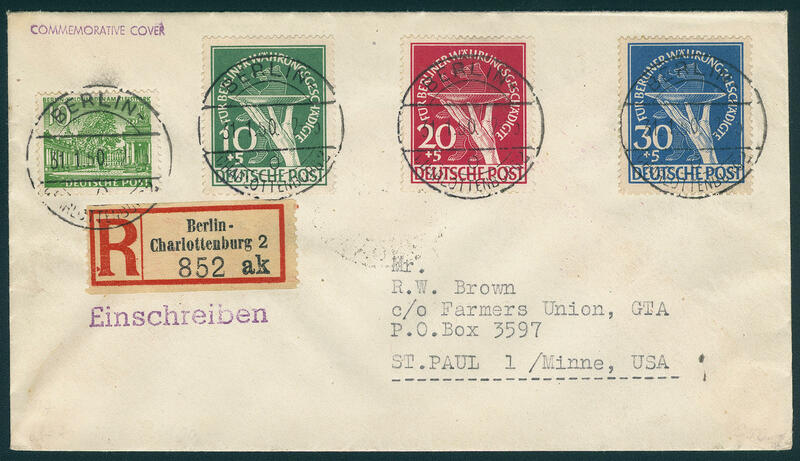 6489 ✉ 64/67 Green overprint 1949, faultless set franking on very nice registered cover from \"BERLIN-CHARLOTTENBURG 29.8.49. 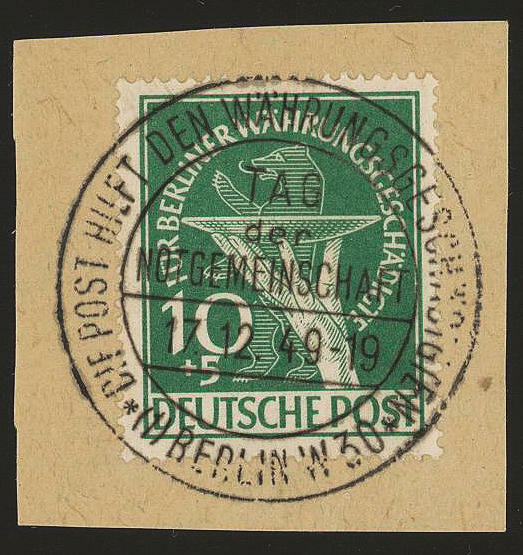 \" to Cologne with arrival postmark. Rare! 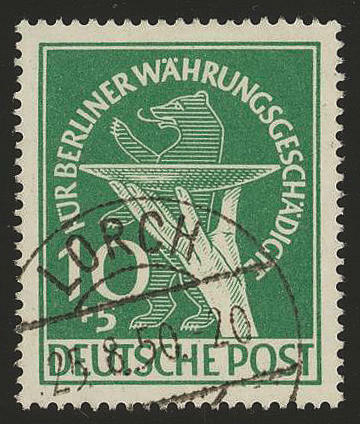 6490 ✉ 67 1 DM green overprint, fresh colors and in perfect condition as scarce single franking on very nice Postal service fast service letter from \"BERLIN-SPANDAU\" to Berlin-Steglitz with seven transit and arrival postmarks front- and reverse. Actual had 8 Pfg. 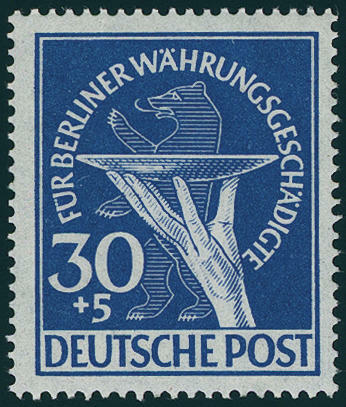 Franking suffices, however has the sender adress seeming from Ignorance the letter fee from 20 Pfg., the in the post express fee from 80 Pfg. Already included was, once again additional pasted up. 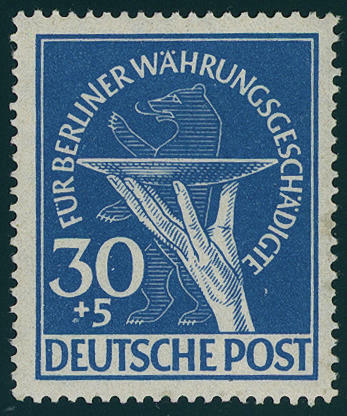 Only very few letters of this kind have become known. 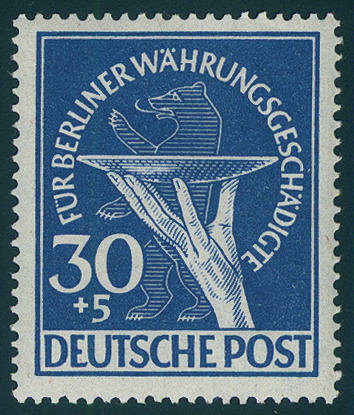 An especially attractive and rare copy! Expertized Schlegel BPP. 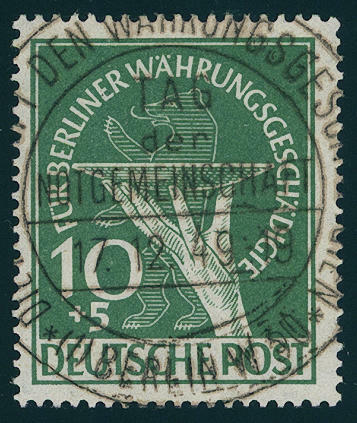 6491 ✉ 67 1 DM green overprint, in perfect condition as scarce correctly franked single franking on air mail letter (25 Gram) from \"BERLIN-CHARLOTTENBURG 4.4.50. 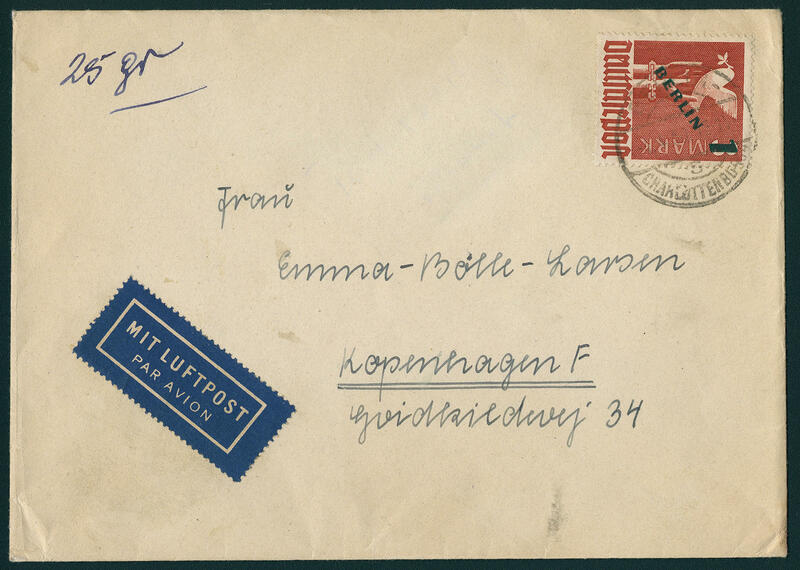 \" to Copenhagen / Denmark. 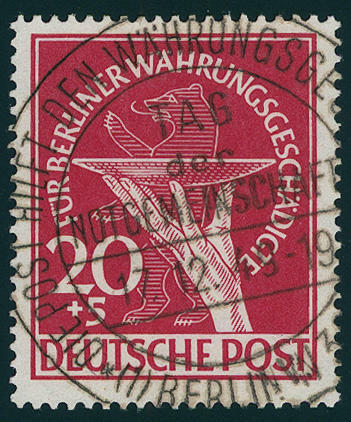 Commercially related correctly franked single frankings of this issue are rare! 6492 ✉ 68 10 Pfg. 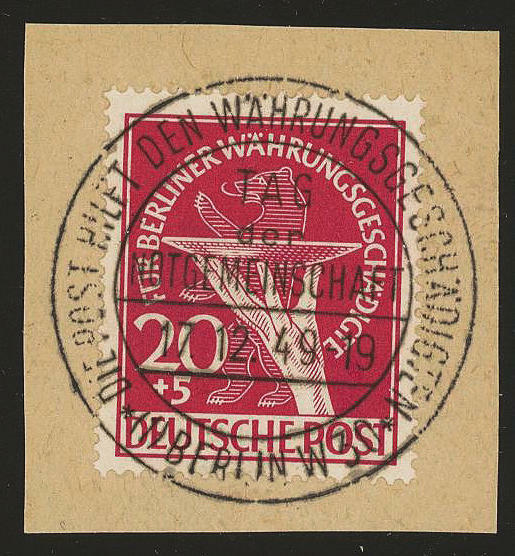 Monetary reform vitims with se-tenant additional franking on correctly franked gef. 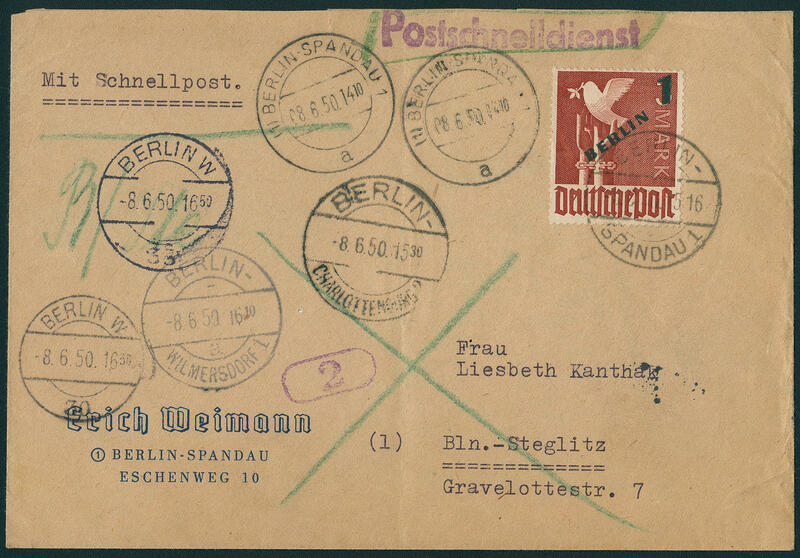 Certificate of delivery over a package from \"BERLIN-STEGLITZ 12.12.49. 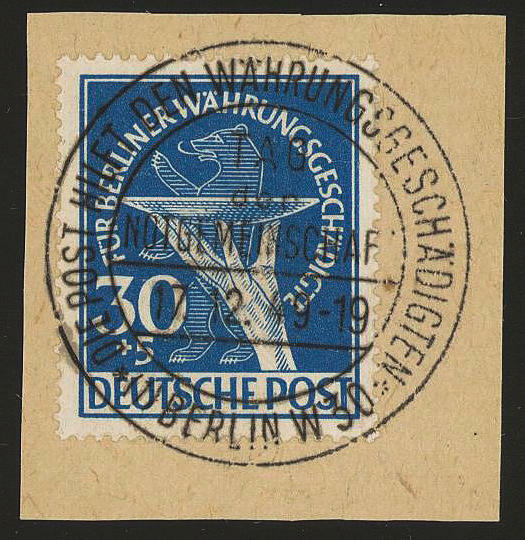 \" to Scharzfeld / South Harz. 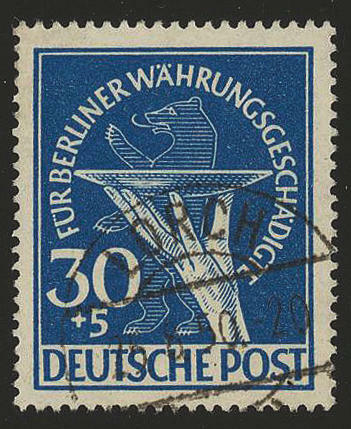 An extremely scarce utilization, the to the top pieces the Berlin philately counts! 6493 68/70 Monetary reform vitims set 1949 from lower margin, fresh colors and in perfect condition mint never hinged Michel 350,- €. 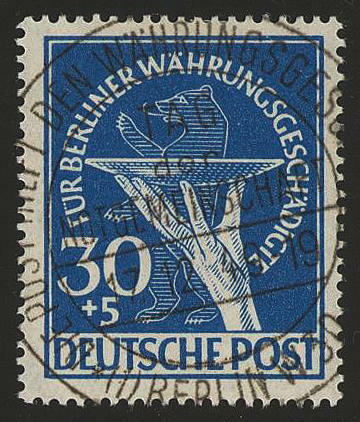 6494 68/70 Monetary reform vitims 1949, fresh colors and in perfect condition mint never hinged, key value expertized Schlegel BPP. Michel 350,- €. 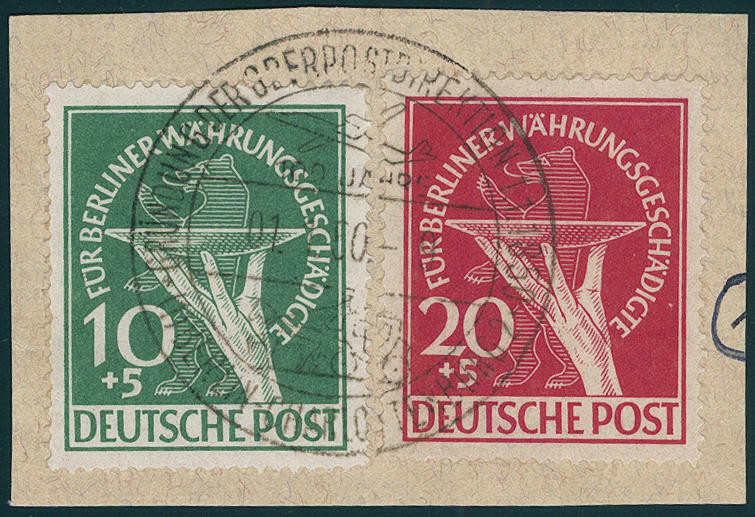 6495 68/70 Monetary reform vitims set 1949, fresh colors and in perfect condition mint never hinged, key value expertized Schlegel BPP. Michel 350,- €. 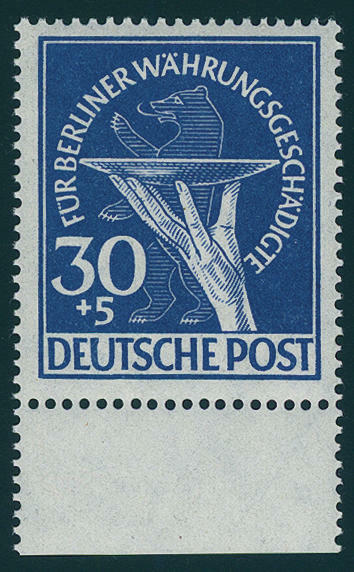 6496 68/70 Monetary reform vitims 1949, fresh colors and in perfect condition mint never hinged, without any signs. Michel 350,- €. 6497 68/70 Monetary reform vitims set 1949, in perfect condition mint never hinged, expertized Schlegel BPP. Michel 350,- €. 6498 68/70 Monetary reform vitims set 1949, in perfect condition mint never hinged, expertized Schlegel BPP. Michel 350,- €. 6499 68/70 Monetary reform vitims 1949, in perfect condition mint never hinged without any signs. Michel 350,- €. 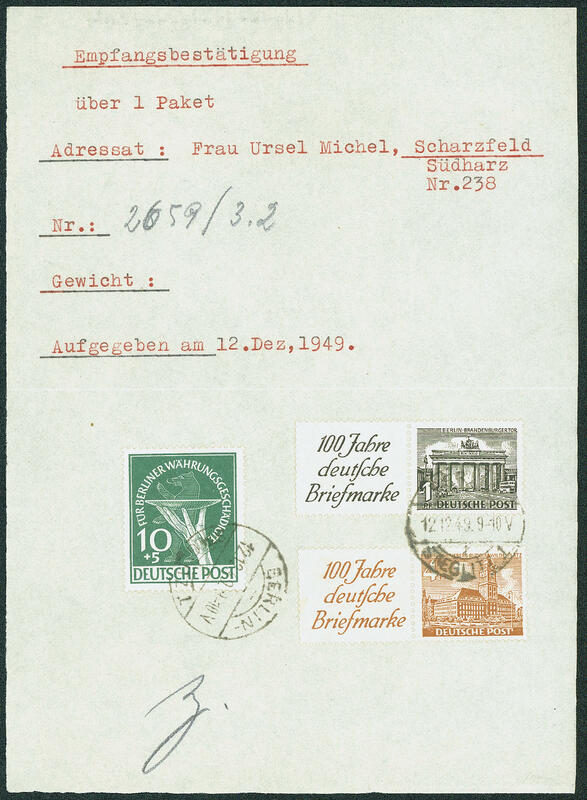 6500 ⊙ 68/70 Monetary reform vitims set 1949 including Michel no. 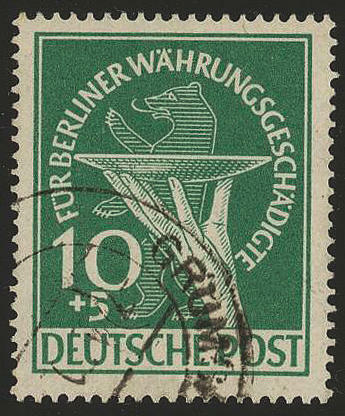 68 II, fresh colors and in perfect condition with perfect centered special cancel \"BERLIN day the Need partnership 17.12.49. \". A lovers series! Photo expertize \"the condition is perfect\" Andrew Schlegel BPP. 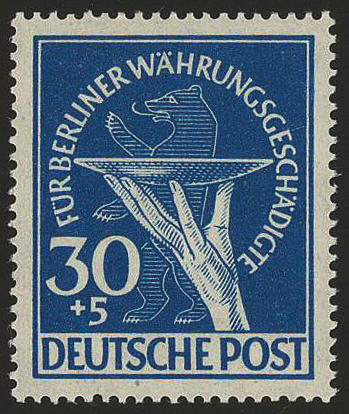 6501 ⊙ 68/70 Monetary reform vitims set 1949, fresh colors and in perfect condition, uniform neat cancelled \"LORCH 25.8.50. \". Photo expertize \"the quality is perfect\" Hans-Dieter Schlegel BPP. Michel 600,- €. 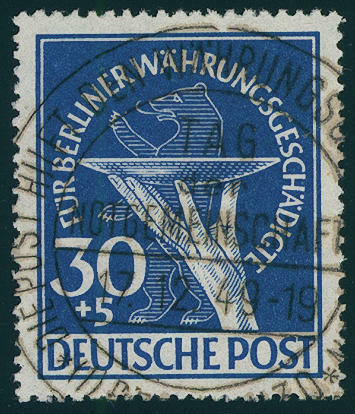 6502 ⊙ 68/70 Monetary reform vitims set 1949, fresh colors and in perfect condition round cancelled, expertized Schlegel BPP. Michel 600,- €. 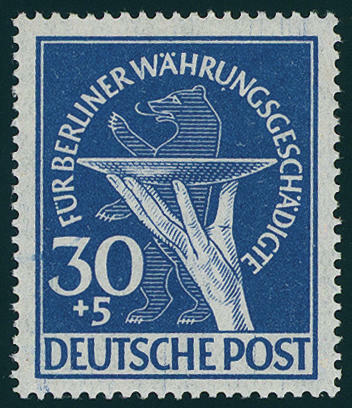 6503 ∆ 68/70 Monetary reform vitims set 1949, fresh colors and in perfect condition on letter pieces with special cancellation \"BERLIN-CHARLOTTENBURG 1.1.50. \", photo expertize Hans-Dieter Schlegel BPP. Michel 600,- €. 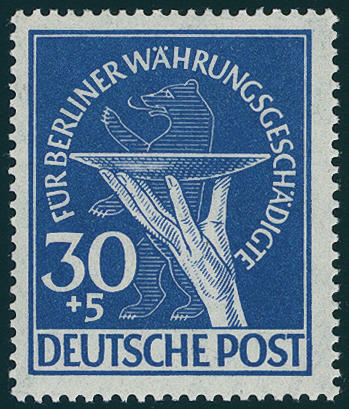 6504 ✉ 68/70 Monetary reform vitims set 1949 with 10 Pfg. 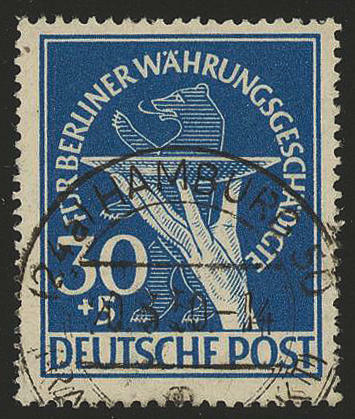 Buildings, all values fresh colors and in perfect condition on very nice registered cover from \"BERLIN-CHARLOTTENBURG 31.1.50. 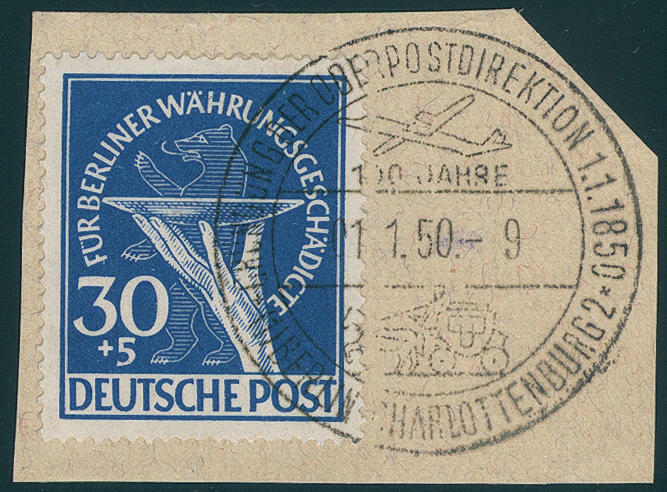 \", correctly franked franked, to the United States with arrival postmarks. A very fine example! 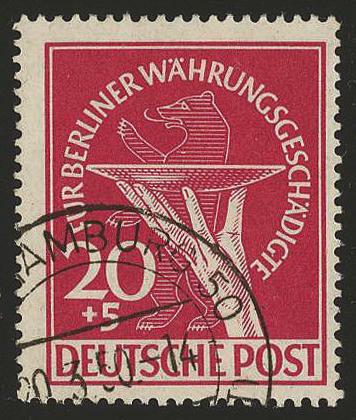 6505 ∆ 68/70I Monetary reform vitims set 1949 on beautiful letter piece with centered clear special cancel \"BERLIN 17.12.49. \". As well the 30 Pfg. 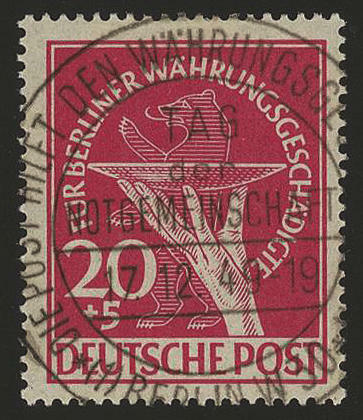 With plate flaw \"additional vertical hatching stroke IN patera\". A dream set for the highest standards! Photo expertize \"the quality is perfect\" Hans-Dieter Schlegel BPP. Michel 880,- €. 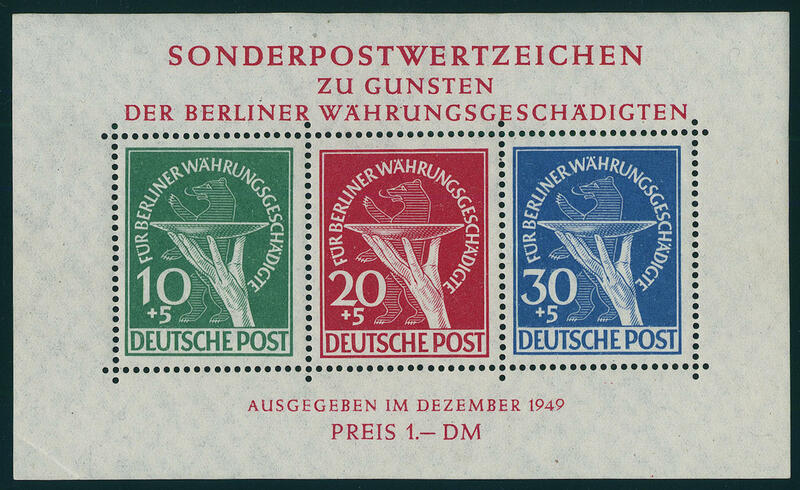 6506 ⊙ 68II/70 Monetary reform vitims set 1949, fresh colors and very well perforated, uniform with centered special cancel \"BERLIN 17.12.49. \". As well the 10 Pfg. 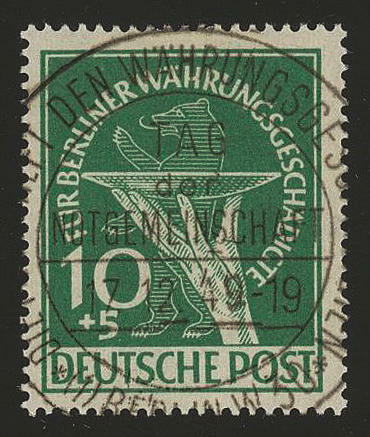 With plate flaw \"green dot right at the wrist\". Photo expertize \"the quality is perfect\" Hans-Dieter Schlegel BPP. Michel 1120,- €. 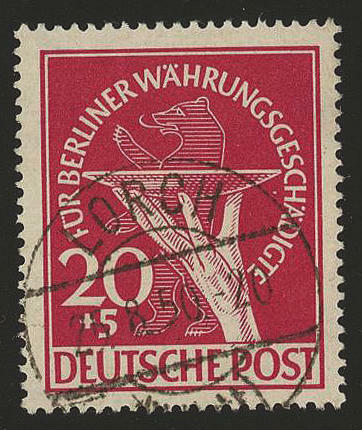 6507 Bl.1 Monetary sovenier sheet 1949, fresh colors and in original size, unused, left at the bottom corner crease.